Gigi has started the skirt from Knitting 24/7 by Veronik Avery. Jasmin has finished her Pogona, but ran short on yardage. Gigi has finished the hood on her Cassidy cardigan. Jasmin is working on Andrew's "Cake" socks again (yarn by Creatively Dyed, base is J'ouvert). Gigi plans to knit one sock per week in 2011. Jasmin is going to cast on the Mariah sweater out of her hot pink cashmere. Gigi has felted her felted Christmas ornaments. Gigi talks about having knit some of Nicky Epstein's felted bags. Bring a preemie cap to donate, get something special. We answer a question from the What do you want to hear about thread. We talk about holding two strands of yarn together at a time. Gigi forgets the Twisted German cast-on. She also ends up with odd gauge on a pair of vanilla socks, and goofs up her Cozy Cables socks (from Sock Club). 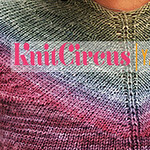 This week, we review Knit. Sock. Love. by Cookie A. We LOVE it! Jasmin has plied the woolen half of the Purple Rain superwash merino (from Crown Mountain Farms) on the Hansen MiniSpinner. Jasmin set the last of the Crimson Shadows from Three Bags full for Gigi. What an informative and nice podcast, I especially appreciated the in-depth review of Cookie's book and your honest opinions. Thanks!